Are you in need of digestive relief but can’t seem to get results, or worse yet, you can’t even make it in to see a doctor? If you’re seeking medications make sure you read reviews such as spectrum awakening reviews first. And if you want a holistic solution for your digestive problems but can’t get access to holistic or naturopathic medicine, there is hope. Technology has been a game changer in health care, and online medical consulting can provide fast, personal, and effective relief, according to Dr. Sasha Rose, a board-certified naturopathic doctor, digestive health expert, and owner of Wildwood Medicine in Portland, Maine, where she has a digestive heath practice. You can also find her online at drsasharose.com. How does online consulting work? 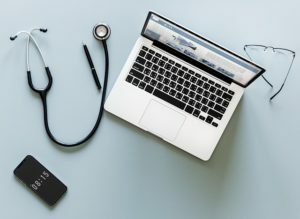 Online health consultations are becoming increasingly popular, especially if you live in a remote area or even in a city where you have trouble getting to a naturopathic doctor or a digestive health expert. “Online visits are particularly effective for busy people and for those in rural areas,” says Dr. Sasha, and it’s not complicated. “If someone has the internet and some kind of camera on their computer or their phone then we can make it work.” After 14 years of practicing holistic medicine from a brick and mortar office, Dr. Sasha’s virtual consultation business is quickly growing and she admits that for many of her patients, online healthcare has been as effective as in-person treatment. A holistic approach to digestive disorders differs widely from the conventional approach and is based on the premise that given the right tools, the body can health itself. Much of the relief available from acid reflux and heartburn is not found by taking pills or supplements, says Dr. Sasha, it’s found by uncovering the root causes of digestive disturbance. “Pills and supplements are nice adjuncts,” says Dr. Sasha, but they are short-term fixes and they often do not deliver the long-term or even permanent relief that is achievable. To get started with online health consultations, Dr. Sasha recommends visiting her website to learn more. The easy step-by-step process begins with scheduling three initial visits to get on the road to better digestive health. Before the first visit, patients are asked to share as much past medical history as possible. “By the time I hear from people, they typically have already been to their primary doctor or their gastroenterologist,” she says, “I encourage people to send records and lab work ahead of time so that I have as much background information as possible before we actually have our face-to-face virtual meeting.” Once that has been done, Dr. Sasha will schedule your first online consultation. The first virtual consultation usually lasts one hour and is very similar to what you would expect from a doctor’s office visit. Dr. Sasha will ask a series of questions, review your past medical history, your symptoms, supplements or treatments, and other aspects of your lifestyle. “Then we talk about what I think might be going on and we come up with a treatment plan that both of us feel comfortable with,” she says. “I lay out the various tools and inform people of what has worked for patients in other situations.” The first visit concludes once an initial treatment plan has been agreed upon. Your second visit will be scheduled for about two or three weeks out, depending upon the circumstances. In the meantime, patients have access to Dr. Sasha via internet or phone with any questions or clarifications. “I like to give patients time to start out on their treatment plan and make some of the lifestyle modifications, and if we are doing any testing, we have time to get those results and for me to see them.” The second visit is a chance to assess what is working and to make any necessary modifications. Dr. Sasha’s online practice is designed to support patients in an effective way that produces fast yet permanent results and gets patients on their way to living the life they want to live. The third visit is often scheduled much farther out so that patients have time to implement changes and start to see and feel lasting positive change. It’s important for patients to recognize that they may not see traction after only one or two visits. It can take time and Dr. Sasha has found that a minimum of three visits is needed to secure long-term solutions. The beauty of virtual medical consulting is that Dr. Sasha is available to support your journey back to health and you don’t have to wait for an in-person visit to get advice, support, and treatment.